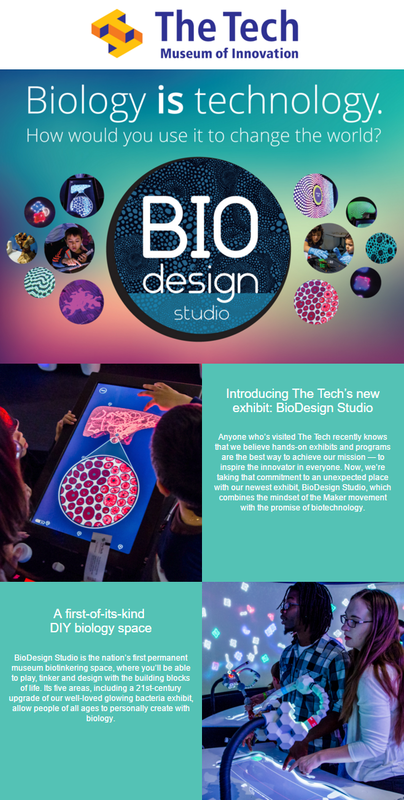 San Jose, Calif., — The Tech Museum of Innovation will empower visitors to play, tinker and design with the building blocks of life in BioDesign Studio, a new exhibit opening Friday, March 18. The exhibit will feature the nation’s first museum biotinkering space and an interactive exploration of how biology is technology. Visitors will use lab equipment to create their own mix of colorful DNA; learn about genetic traits by “coding” the pattern of a bear’s fur; use computerized blocks to build new creatures and release them into a digital world to interact with other beings; explore how bioengineering could impact the future; and do hands­on activities in the BioTinkering Lab. The BioTinkering Lab will, over time, play host to citizen science projects as well as drop­-in activities like creating mushroom bricks, in which visitors transform wood particles that would have been sent to landfills into sustainable building materials using mycelium. Planned to last for 10 years, the exhibition, like biology itself, will evolve. The $5 million exhibit was made possible by several generous foundations including the Gordon and Betty Moore Foundation and the Franklin and Catherine Johnson Foundation.